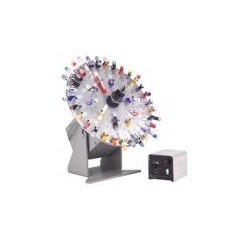 Modeled after our Rugged Rotator, this unit offers a multi tube head suitable for applications requiring the use of small samples with reliable results. Up to 40, 5-10mm micro tubes can be attached and mixed from a gentle slosh to a rapid agitation. Equipped with tilting motor brackets, a variety of mixing actions can be obtained. Electrical: On/Off switch separate from speed control, fuse-protected, 6-ft.,3-wire cord. Load Weight Capacity: 5 lbs.